Oxford University came into being gradually, around the year 1200, and a community of book-makers were soon established in the town, centred around the Catte Street and St. Mary's Church. Documentary records suggest that these book-makers not only provided students with the necessary textbooks, but also specialised in meeting the needs of the luxury market: a disproportionately large number of illuminators are recorded. This psalter is probably one of their products: the calendar and litany include three entries for St. Frideswide, the patron saint of Oxford. 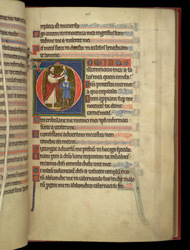 This initial 'D' to Psalm 26 shows Saul pouring oil onto the young David's head to anoint him. The naked bald male figure sitting astride the ascender of the initial (which is itself formed of a dragon whose tail is made up of foliage) is an unusual and early precursor of the marginalia that was to become popular towards the end of the century.